So it’s been about a month now since Britmums when I met with my sponsor, Boots UK, for a little chat about staying safe in the sun and a couple of weeks since we went on a little adventure to the Cotswolds to put all my knowledge into action. We literally couldn’t have asked for better weather on our adventure, in fact it was probably two of the hottest days we’ve had all year which made it even more special, had it been raining it just wouldn’t have been the same. 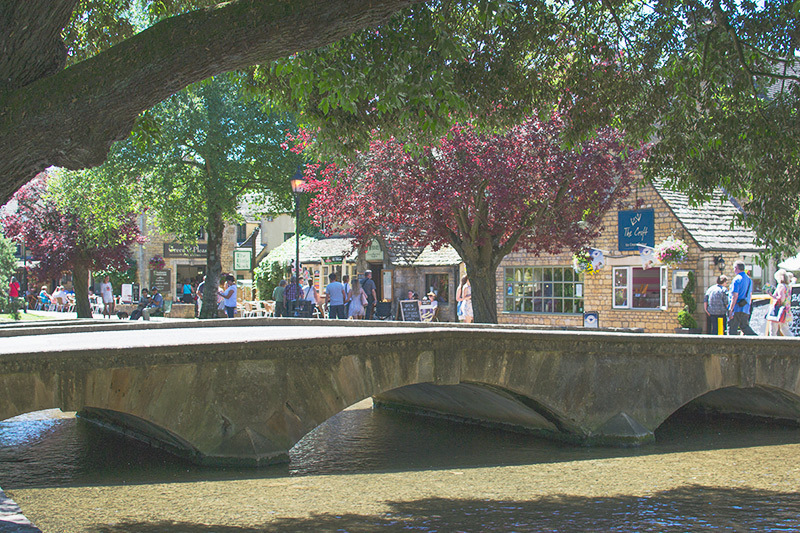 The Cotswolds is one of my favourite areas of the UK, especially the little villages like Stow on the Wold and Bourton on the Water. One day, if all our other plans don’t work out then a move there will definitely be on the cards. We set off one morning and after a little stop at Gloucester Services (the BEST service station in the whole world due the design and the farmshop / local produce they sell) we headed to Bourton on the Water. It’s known as the ‘Venice of the Cotswolds’ because of the river running through it. The river is only a few inches deep though so kids can get in and splash around in it and you can sit on the grass banks next to the water with a picnic, it’s just perfect! Lined all down the river are little tea rooms and shops, lots with tables outside so you can sit and enjoy the scenery. It’s just so pretty there! The kids had great fun splashing around in the water, this did mean we had to make sure we had applied sun cream properly due to the sun’s rays reflecting off the surface. If your sun cream is water resistant then it will be fine when getting splashed but if you get out and dry yourself with a towel then that leads to it all being rubbed off and needing to be reapplied fully. Ideally children need to be wearing sunglasses to protect their eyes from the sun’s rays, children are more at risk due to their larger pupils. Mine just won’t keep them on though so hats are the next best thing and luckily they are happy to wear them. Did you know eyes are ten times more sensitive to the sun’s rays than your skin? And apparently still need protecting on cloudy days (cloud only reduces the UV light by 10%! ), this is good to hear because I rarely go out without sunglasses on no matter what the weather! 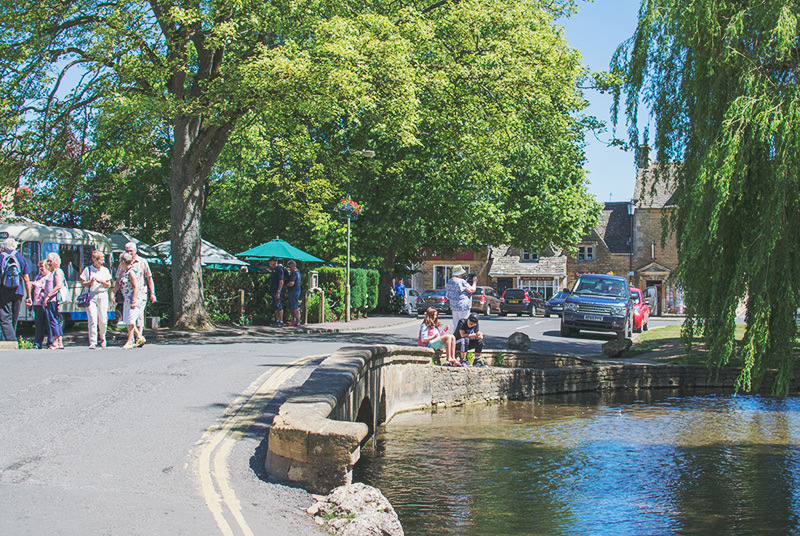 We bought some lunch from this lovely little bakery and sat by the river to eat it before going to visit the car museum and model village, I’ve actually written a post about things to do in Bourton on the Water as we loved it so much. Next on the places to visit was Stow on the Wold. This village actually has lots of memories as it’s where we went the day after Cherry was conceived (obviously we had no idea! ), we’d split up a few weeks before but decided it was a mistake so met up in a hotel in Cheltenham. I had moved up to live with my dad and Mr C was still living in Somerset to that was the half way point, I can remember him telling me that his sister had just found out she was pregnant and it made me all emotional, little did we know! Fast forward five years and there are now seven cousins all really close in age! Stow on the Wold is another picturesque little village full of little tea rooms and shops. We found a vintage shop with a door way so blocked with things that you couldn’t fit a pushchair through it, had a feeling that might have been done on purpose 😉 Not that I blame them, Tiger has a thing for pulling things off shelves at the moment. We took it in turns to have a look and Cherry very nearly brought a whole display down by sitting on a rocking chair! How beautiful is this crockery?!! After having a little walk around and sitting on a bench to eat lots of cherries we headed over to where we were staying for the night. We stayed at The Crown Inn in Frampton Mansell, it’s a lovely pub with a separate block of rooms located in a gorgeous little village with stunning scenery. We had dinner in the pub, it was actually so hot we had to sit inside! Then after dinner we walked up to the little village park. We probably could have done with some mosquito repellent at this stage as there were lots of them flying around, it works by affecting their ‘internal landing gear’ and makes them so disorientated that they fly away instead of landing on you, clever huh?! Weirdly when we woke up the next morning we were all sneezing and Mr C who usually suffers with bad hayfever had it way worse than normal so we came to the conclusion that it must be down to a different type of pollen. We had to make an emergency trip to the pharmacy to buy some nasal spray, it’s the best treatment for more severe symptoms, because he had forgotten to bring his with him! The only one thing he had to remember to bring and he forgot!! So it just goes to show that summer can be a really enjoyable time but there are lots of things you have to remember to do to make sure you remain comfortable enough to enjoy it. Getting sunburnt, dehydrated, covered in itchy bites and sneezing your head off with runny eyes just wouldn’t be quite as much fun. So if you have any summer adventures booked then take a trip to Boots UK to stock up on all the essentials! What do you enjoy the least about the summer months? Thanks to Boots UK for covering the cost of our trip to The Cotswolds.